In a pan on medium heat, add cooking oil. Add cinnamon sticks, cloves, black pepper corns and cumin seeds. Also add sliced onions. Sauté for 2-3 minutes. Now add cut potatoes, mix well and cover the pan to get potatoes cooked. When potatoes are half done, add ginger-garlic and all the vegetables. Sauté on high for 3-4 minutes. 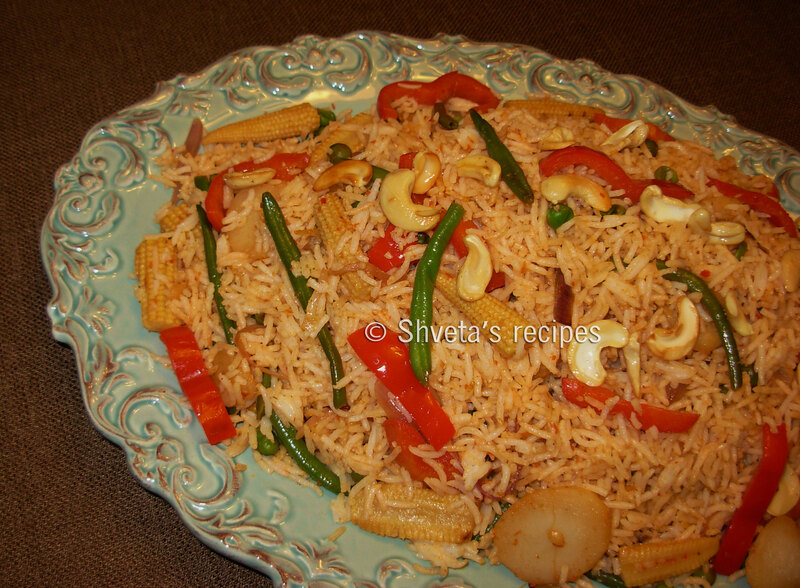 Add all these cooked vegetables to the cooked rice and add red chili powder, turmeric powder, garam masala and salt. 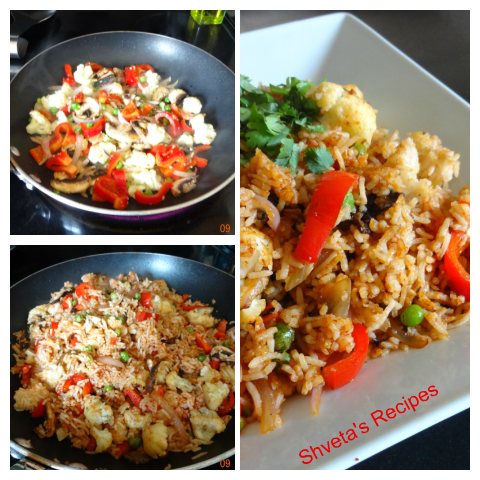 Mix well and slow cook the vegetable fried rice half covered for 4 more minutes. 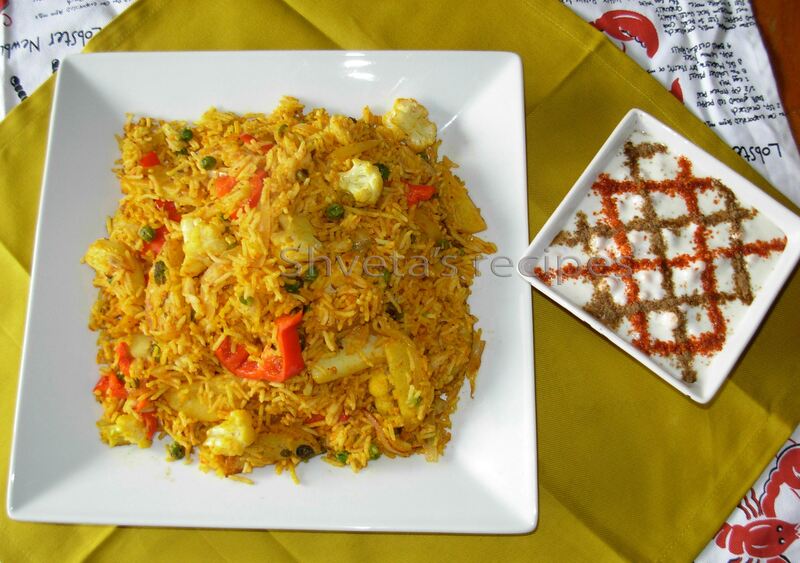 Serve steamy vegetable fried rice with boondi raita [spicy yogurt] for any meal. 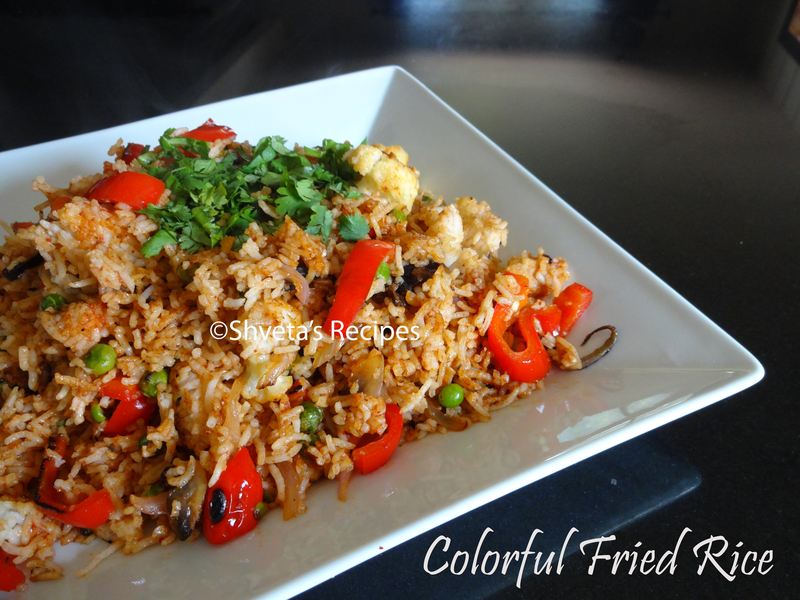 Pineapple fried rice is one of my favorite entrée to order at Thai restaurants. This is my own version with few additions. Kids love it too. 1. Cook the rice with 2 cups of water and 1 cup coconut milk. 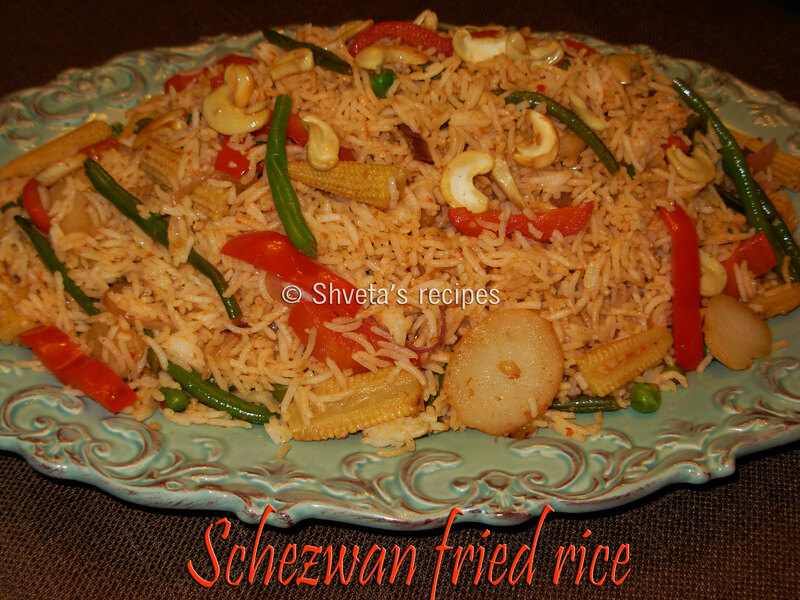 Let the rice cool completely or let it sit in the refrigerator for couple of hours after cooking. 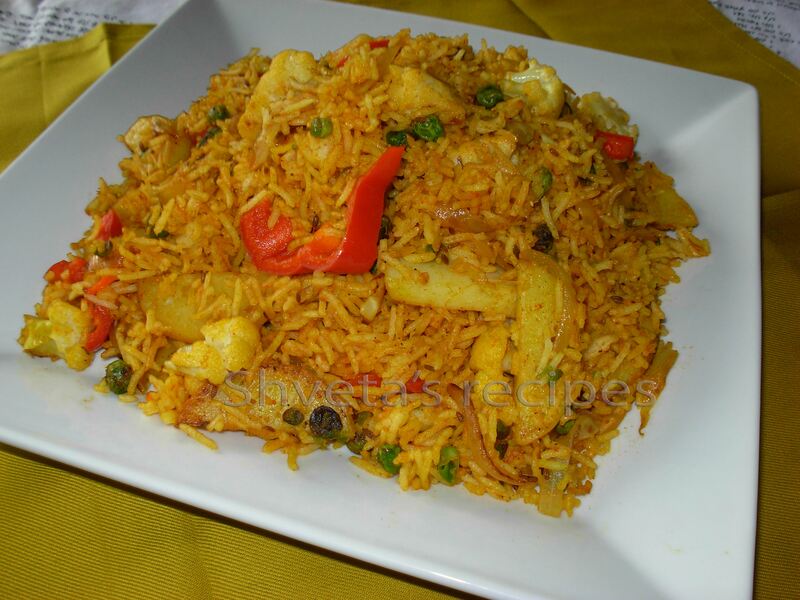 This recipe is good for using leftover white rice too. 2. Rinse and prepare all the vegetables as directed. 3. Cut paneer into small cubes and shallow fry it. Keep fried paneer aside. 4. Heat the wok and add 2 tablespoons oil. When the oil is hot, add the minced ginger and stir-fry briefly until aromatic. 5. Add all the vegetables, pineapple chunks and cashews. Stir fry on high heat for 2 minutes. 6. 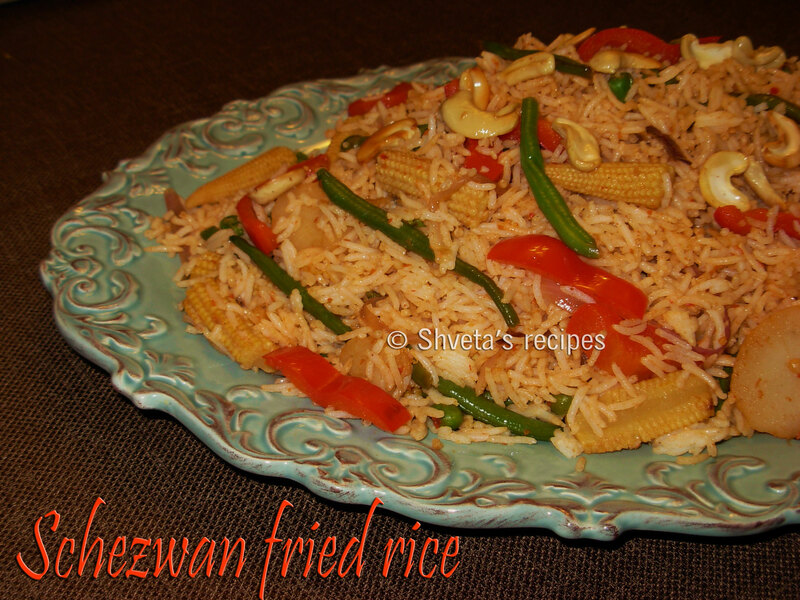 Add cooked rice carefully and mix well. Add fried paneer cubes to it. 7. Stir in Soy sauce, Maggi Hot & Sweet sauce, Garlic chili sauce and salt. Cook for few more seconds. 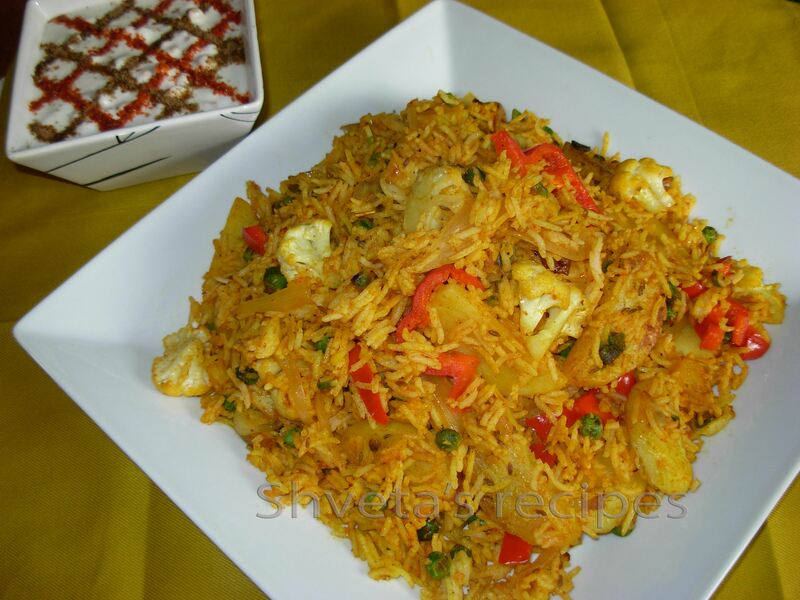 Garnish pineapple fried rice with cut spring onions and serve hot. If possible it can be served in the hollow shell of the fresh pineapple.